These past few months, I have spent a lot (I mean, a lot–like, I-am-sorry-but-I-feel-preternaturally-compelled-to-word-vomit-to-you-guys a lot) of time talking about my upcoming exams. 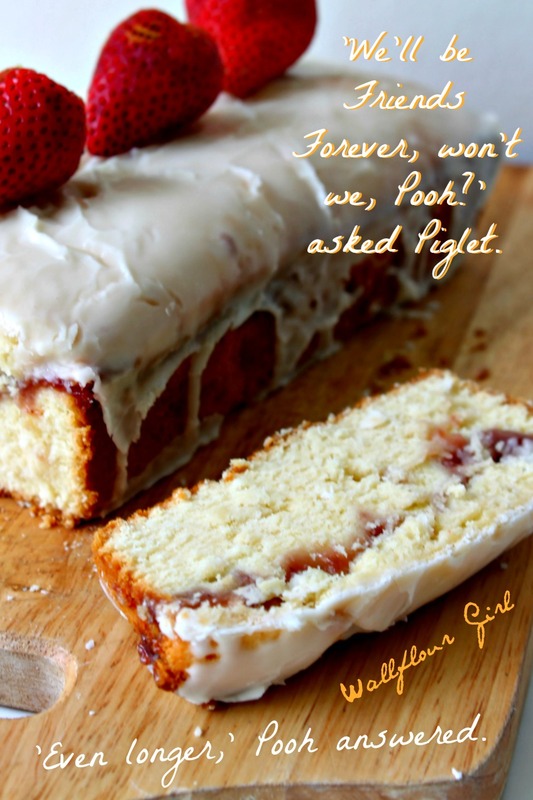 So today, let’s talk friends and the best pound cake you’ve never met instead. 1. The Guilt: You are not supposed to be wherever you are at the moment you are tiptoeing–in which case, #shamingsession. 2. The Terror: You are afraid whomever it is around whom you are tiptoeing is going to explode at the any second. KABLOOIE! 3. The Sympathy: You are at someone’s bedside. 4. The Impending Stardom: You are practicing for your lead role in an upcoming show of “Swan Lake.” Ballerina feet, ladies! Now, I know it is not due to the fact that they are practicing to become world-famous ballerinas, because a) they can’t ALL be leads in Swan Lake, and b) I have not seen so much as a frill of a tutu on any of their persons. Nor can the tiptoeing be attributed to a sympathy-induced bedside manner, because last I checked (granted, this was a few hours ago) I still have a pulse. And finally, I am almost certain that they cannot all be tiptoeing out of guilt, because I have not been lurking around any shady street corners or drug stores lately. Or at least none I’m going to fess up to here. So this leaves us with the inevitable truth: I am a ticking time bomb and my friends are afraid of the Big Kablooie. Right? ^ It’s because of that. It has taken eight months, a whole series of events, and unexpected happiness from various little corners of my life for the truth to hit me with the full force of the giant meteor that killed the dinosaurs. Bigger. Valentine’s Day comes once a year–an exam like this might come once in a lifetime–but friends really, honestly, and truly are forever. And even as I make out the faint rustle of the tiptoers all around me, taking care lest they disturb me from the latest writing frenzy that has possessed my flying hand, I can hear their silent cheers of ‘Rah! Rah!’ rising up in proud defiance of a world whose limits seem at every moment to close in on me, and find they cannot. 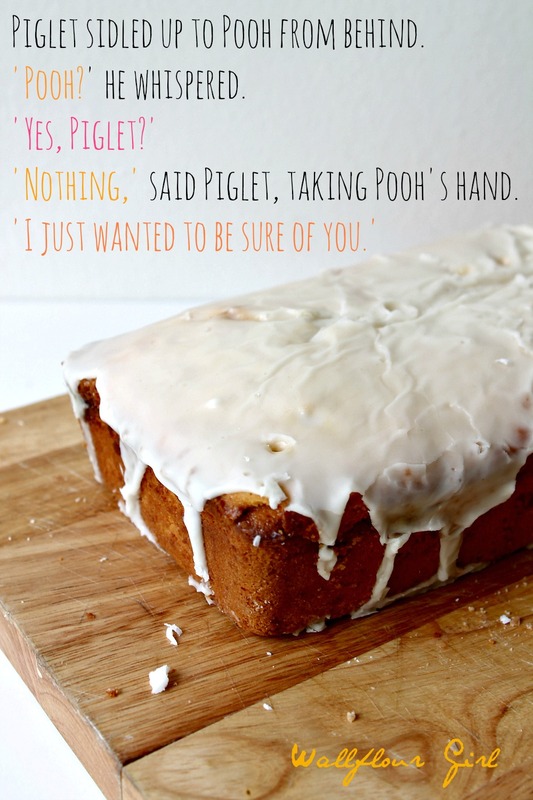 And this finally, finally brings me back to this pound cake I promised I would tell you about. 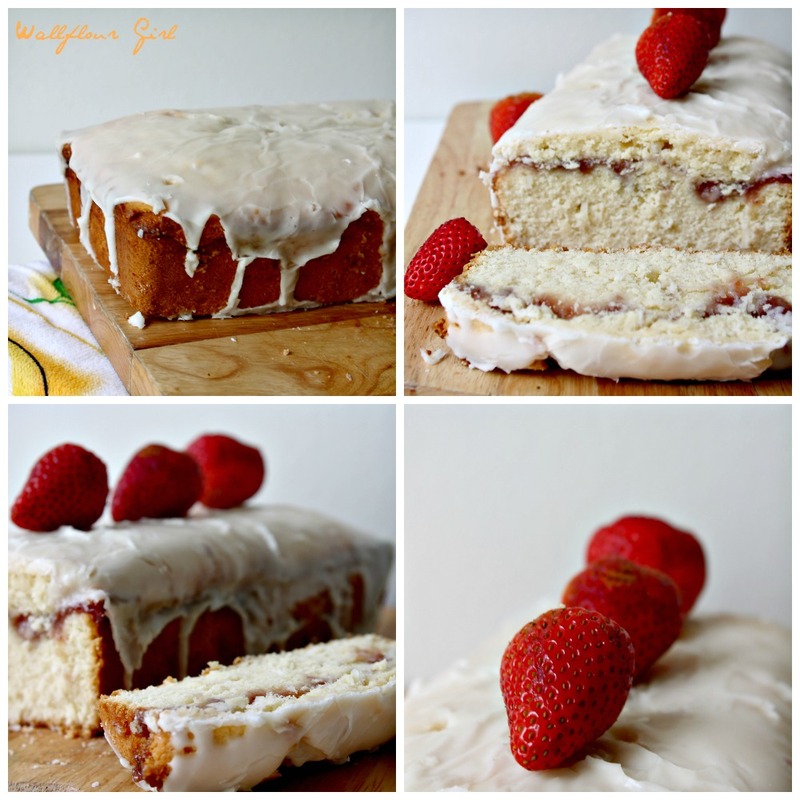 I made loaves upon loaves of this pound cake to share with my friends and to show them how much I appreciate everything they do, from tiptoeing to caterwauling to cheering to reading my blog. They hands down loved it. This cheery lemon pound cake is everything the title/photos say and more: possibly the creamiest, butteriest, moistest pound cake I have ever made. Everything from the melt-in-your-mouth cream cheese in the batter to the fluffiness of the eggs and sugar, as well as the brightness of the lemon and the tanginess of the strawberry jam, make this the ultimate sweet treat to show someone you love them, whether it’s for Valentine’s Day or Friends Day (which is every day in my book!). Don’t forget to take a moment this week to appreciate your friends and all the people you love in your life! In a large mixing bowl, cream together cream cheese and butter until very smooth. Beat in sugar until very fluffy and pale–I beat it vigorously for a good five minutes by hand to get that great creamy pound cake crumb! Mix in eggs, vanilla, lemon juice, and lemon zest. Carefully mix in flour until just incorporated. Pour one-fourth of your batter into one of the prepared 9×5-inch loaf pans. Pour 2/3 cup warmed strawberry preserves in an even layer over this batter, then top the preserves with another one-fourth of your pound cake batter. Repeat with second loaf pan. Bake in preheated oven for 40-50 minutes, until a toothpick inserted into the center comes out mostly clean, possibly with little crumbs sticking to it. Small crumbs (not raw batter!) are great! They indicate that your cake is baked through but not overbaked. Always err on the side of a little underbakedness. At this point, remove your cake from the oven and allow it to cool on the stovetop for at least 30 minutes before removing it from the pan to cool completely. 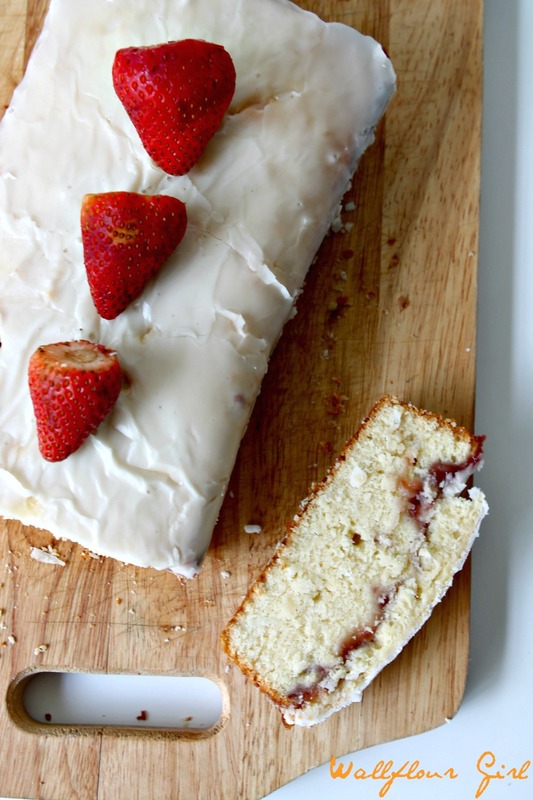 When your pound cake has cooled completely, top with lemon vanilla glaze (recipe below). Whisk all ingredients together in a bowl until smooth. Pour over cooled pound cake and allow to harden completely before cutting and serving. Enjoy! 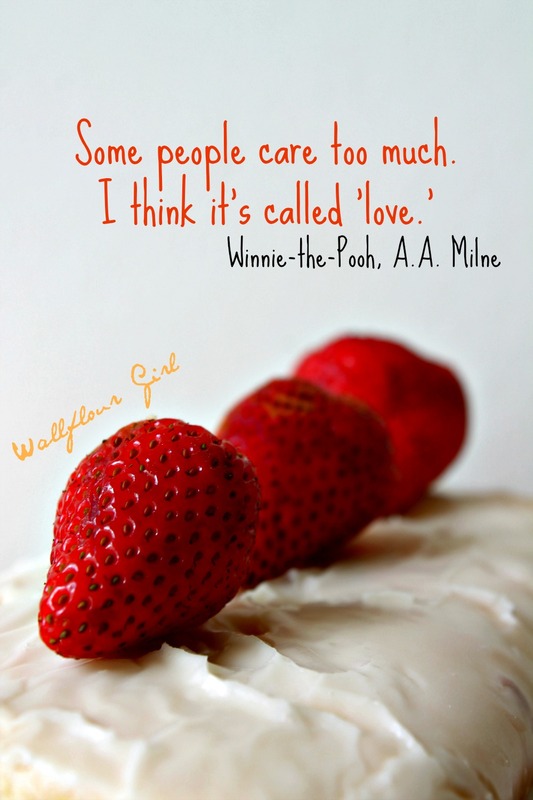 all of these winnie the pooh quotes and references are making me reflect on some of my friendships, too. instead of baking the best pound cake i’ve never met, though, i’ll opt for showing my appreciation with a card or something. this actually reminds me of a birthday card i made for a friend. i tried to think of a friendship quote to write on the front of the card, and ended up taking one from our favorite bear of all time! this comment is getting quite long, so…. the end! HEY GUYS THIS ^ IS THE NEXT A.A. MILNE <3 (The world needed to know that. Told you I'd make it a public event!) You make some of the best birthday cards. Which quote did you use? The fact that we're both Bear fans proves that we're still raging river, you know…. PS I'm so glad you commented even though we're chatting right now. Did I mention that you made my wall of smiles again? 🙂 looks like there'll have to be more PB in your near future, I feel it in my chin! ahaha thanks for that. but you probably wouldn’t have said that if i reminded you that i had to look up who a. a. milne is 😛 it was a quote about being friends forever! and i’m happy to see that term again! only one other person still talks about raging rivers with me, i think haha. Lovely recipe 🙂 Brilliant photos too! Thank you so much, Jessica–I’m glad you love it! Your cake looks incredible and your writing is wonderful. Thanks! You’re so sweet, Cheri–thank you SO much for stopping by and taking the time to read! Best of luck on the big day!!!!! Erika, your comments ALWAYS brighten my day. I’m really pushing myself to put more of the Me into text-editing these photos and integrating them into a broader narrative, so I’m glad someone appreciates it! As for the extra calorie kick: I’m one lucky gal for having the friends I do, but my friends always complain (through stuffed mouths, of course) that I’m trying to fatten them up instead of myself 😀 so I’d say go for it, that’s what friends are for and you won’t regret it! Somehow I get this impression you have this big event coming up in your life. 😉 Relax: you’re smart and you’ve studied, so you’ll do well. 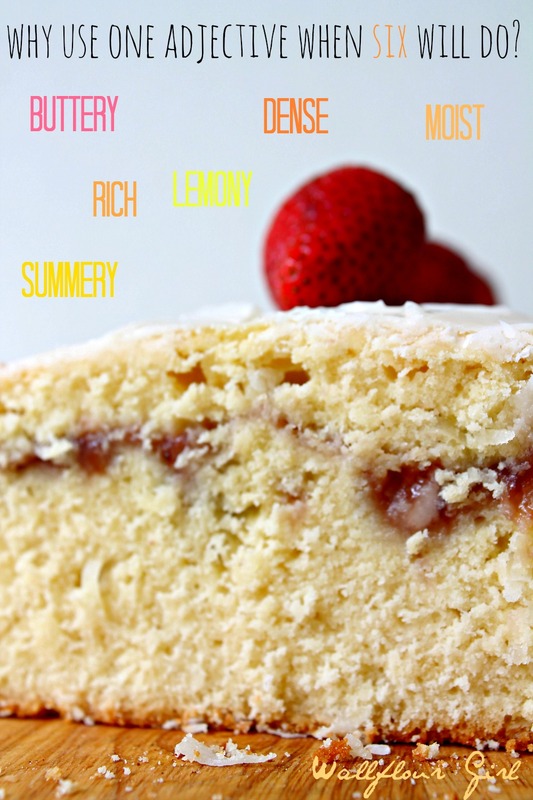 One tip, though: when the subject of Hemingway comes up, don’t reply with “Why use one adjective when six will do?” 😀 Fun post,, great pound cake. Thanks. Heh! Somehow I thought that would come up at some point–thankfully, I don’t have to tackle Hemingway, but it’s probably a good rule of thumb regardless. Thanks for sticking through with my ramblings through thick and thin, John! LOL yes…. Good times. Mine was named selly cuz that’s what the shoebox brand was! Looking back, perhaps we should have made homes for cold pricklies, too. They could have been neighbors and/or friends. Omg, Selly…I think I still have your Two-Tone somewhere. LOL. Even as children, we were supporting a system of appearance-based stratification….sigh. Aww, thanks Jess–say hi to Alex for me!! Maybe we’ll make a trip up to you when I’m back in a few weeks! 🙂 I solemnly swear that if we do, it won’t be empty-handed….haha! Oooh I’m down for this trip. 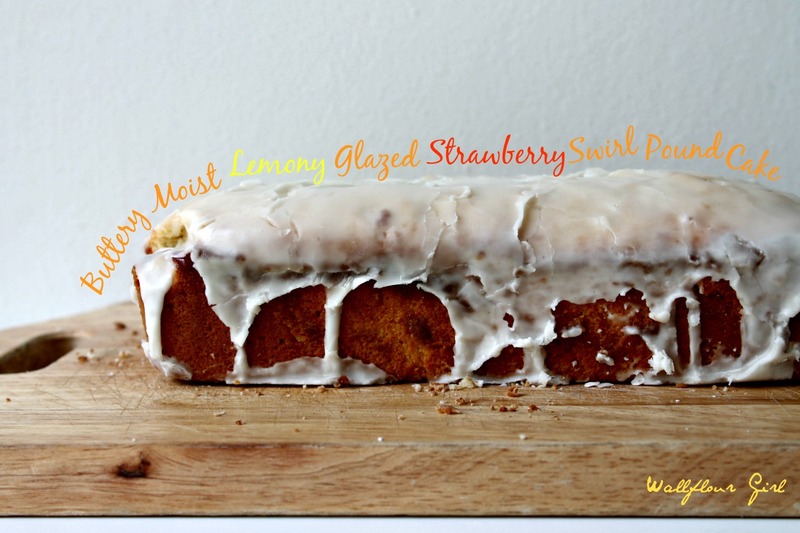 I adore glazed pound cakes and this one sounds delicious! It will be so simple to make it vegan too! ^_^ You can never go wrong with strawberries, can you? Thanks for sharing. The photos are great. I’ve never met a strawberry I didn’t like 😉 if you get to make a vegan version of this, definitely let me know how it goes–thanks for dropping by as always, Tifa, and have a great week! Friends really are forever!! I’d be yours if you sent me this cake. 😉 It’s gorgeous! Haha! Well, know that I’d be sending you this cake pronto if I knew it would hold up en route. Thanks for reading, Dorothy! 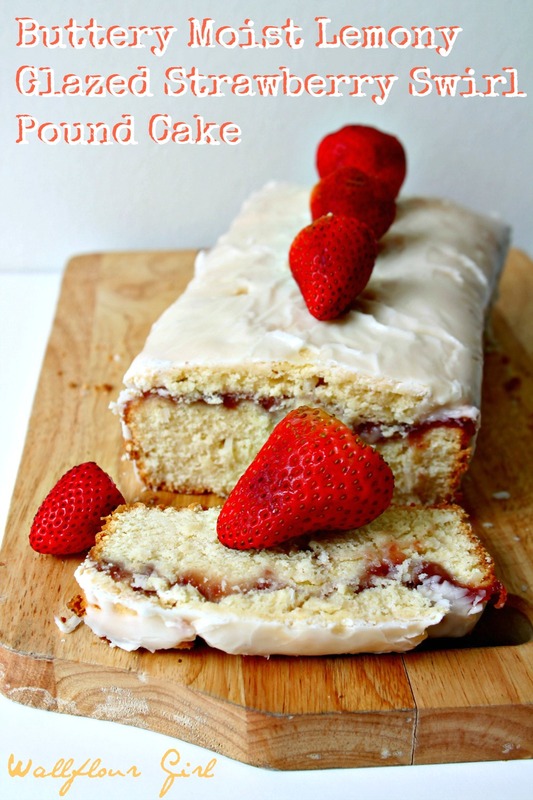 Love this moist cake with all that jam peeking out of the middle and the yummy glaze! 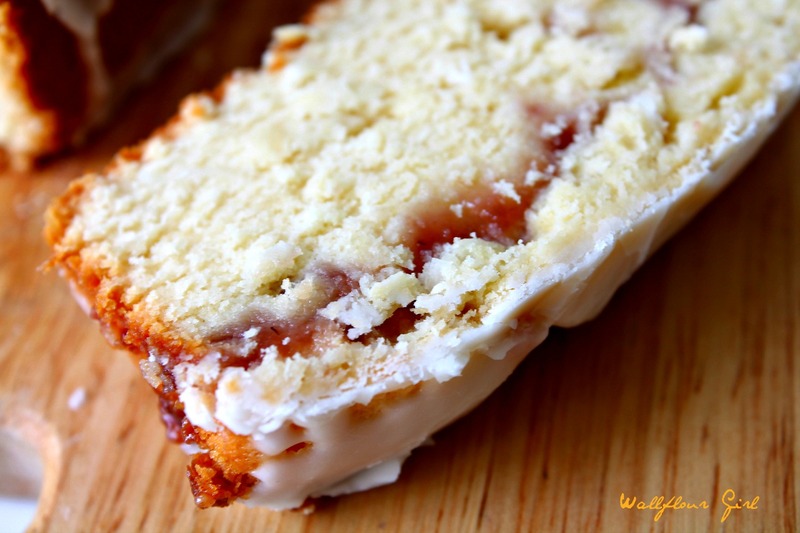 You could definitely add another layer of jam to ‘peek out’ (I love that phrase!) of the loaf, too–thanks for stopping by, Laura! Hah, that’s my favorite part as well! I’ll have to add an extra stripe or two next time to curb my cravings. Thanks for reading, Erica! I PROMISE to make this cake that is 2 cake pans or one tube pan. This looks so delicious that only one with SUPREME self control could NOT make this. Thank you so much — I love your enthusiasm. hahaha thank you SO much, Barbara! Your comment totally made my day. I hope you do make it and that you love it as much as we did!